Comedy has long been used to subvert the established order, shedding light on modern life's pervasive absurdities and fomenting distrust of potentially seltzer-filled boutonnieres. Challenge flower-loving instincts with this GrouponLive deal. $10 total food credit. See the full menu. Shows run seven days a week, and doors open 30 minutes to an hour before showtime. Although lineups are not typically announced in advance, click here to check out frequent performers. Limit 2/person. 24hr advance reservation required. Redeem on day of show for a ticket at venue box office. 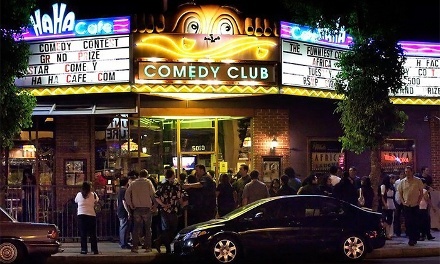 Must show valid ID matching name on Groupon at Ha Ha Café Comedy Club. Refundable only on day of purchase. Discount reflects Ha Ha Cafe Comedy Club's current ticket prices-price may differ on day of event. Doors open 1 hour before showtime. Must arrive 30min prior to showtime. For ADA seating, call box office promptly upon receipt of voucher - availability is limited. 2-drink min. purchase/person. Not valid for special events. Valid Sun-Thur only.